Today, long time after not posting here, I'm finally back, with temptation to introduce you to http://www.efoxcity.com/ , amazing page where you can find all the things girl needs- from jewelry, sweaters, blouses, jackets, to amazingly perfect dresses-discount evening dresses ,Summer dresses (it's never too early to start thinking about Summer, right?Unless you're Australian, then this one's perfectly timed for you) and even perfect and most important dress in woman's life (or not.I don't know actually, to be honest. I'm too young for stuff like that, and I was just trying to sound absolutely wise)- wedding dresses. So, today's post is all about round neck, knitted beige sweater! This one below you can purchase for only 19.99$ on efoxcity.com!Crazy, huh? It's looking both fabulous oversized or slim-fitting, but if you're asking me, I prefer oversized ones. Once you've decided(for example) to buy oversized one, you can go right into making combinations with the stuff you already own. 1; (beige sweater)+denim button up beneath+black skinny jeans+spiked oxfords. so, yes.That's all from me now. Thank you, and see you next time! I am sure yo check them out, just for that knitted sweater ! check my blog if you want! I know this brand is very fashion and cheap! 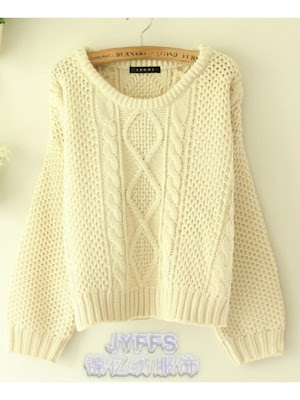 i love love love love love this sweater! i really want it!!!!! I have read so many great reviews on efox city. The sweater looks really nice! So cute :) I've heard of them before, seems nice. Thank you so much for your comment hun, it made my day! Of course we can follow each other! I'm following you now so please follow back! This seems like the perfect cute and cozy sweater! That sweater looks like butter. YUM! Wow your blog is great, I really enjoy reading it..